Most estimates of Chinese regional Surface Air Temperatures since the late-19th century have identified two relatively warm periods – 1920s–40s and 1990s–present. However, there is considerable debate over how the two periods compare to each other. Some argue the current warm period is much warmer than the earlier warm period. Others argue the earlier warm period was comparable to the present. In this collaborative paper, including authors from both camps, the reasons for this ongoing debate are discussed. Several different estimates of Chinese temperature trends, both new and previously published, are considered. A study of the effects of urbanization bias on Chinese temperature trends was carried out using the new updated version of the Global Historical Climatology Network (GHCN) – version 4 (currently in beta production). It is shown that there are relatively few rural stations with long records, but urbanization bias artificially makes the early warm period seem colder and the recent warm period seem warmer. However, current homogenization approaches (which attempt to reduce non-climatic biases) also tend to have similar effects, making it unclear whether reducing or increasing the relative warmth of each period is most appropriate. A sample of 17 Chinese temperature proxy series (12 regional and 5 national) is compared and contrasted specifically for the period since the 19th century. Most proxy series imply a warm early-20th century period and a warm recent period, but the relative warmth of these two periods differs between proxies. Also, with some proxies, one or other of the warm periods is absent. They then offer possible explanations for the three main observed slowdowns in GST increase. For the first slowdown, they found evidence of El Niño and La Niña weather patterns that likely reduced heating by producing more cloud cover. For the second slowdown, they found evidence of increased volcanism—smoke and ashes from volcanoes can block sunlight. The team asserts that the third slowdown, which is also the one on which many global warming skeptics rely, was likely caused by a combination of La Niña events and volcanism. Abb. 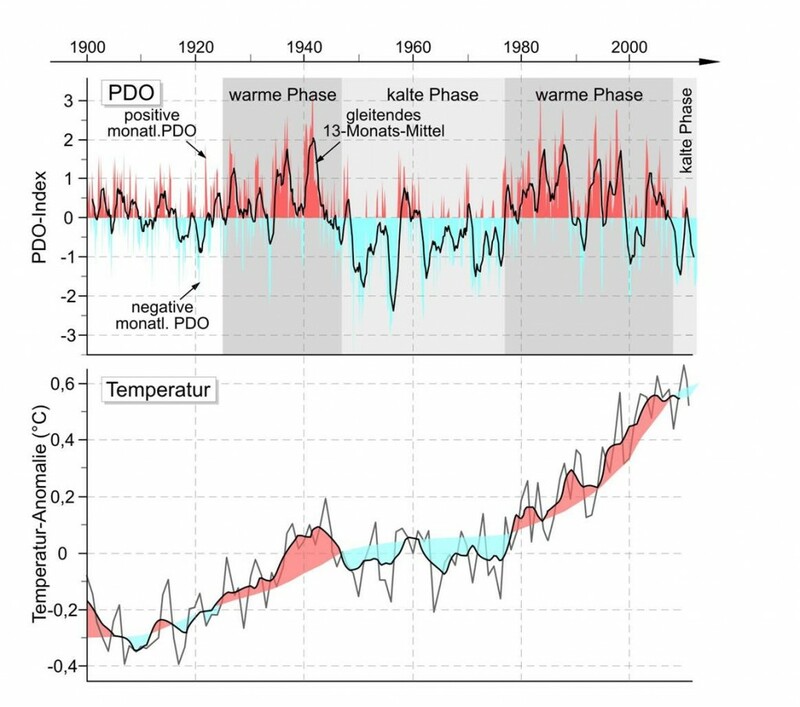 : Ozeanzyklus PDO und Schwankungen in der globalen Temperaturentwiclung. Quelle: Buch ‘Die kalte Sonne‘. Und hinter dem dritten Slowdown soll eine Kombination aus El Nino und Vulkanen stecken. Folland und Kollegen tricksen hier, dass sich die Balken biegen. Im Abstract bringen sie zwar die Sonne als Erwärmungsbremser für den kürzlichen Hiatus ins Spiel. Auf phys.org ist davon keine Rede mehr. Und wenn die Sonne bremsen kann, dann könnte sie auch beschleunigen, wofür in den Modellen aber gar kein Platz ist, denn angeblich soll ja nahezu die gesamte Erwärmung der letzten 120 Jahre durch Treibhausgase verursacht worden sein. Unterm Strich kein Durchbruch im Verständnis der natürlichen Klimavariabilität. Stattdessen wird der Vulkan-Joker überstrapaziert. Immer wenn Kühle gebraucht wird, wird einfach Vulkanstaub in die Computer-Klimawelt gestreut. Frei nach Pippi Langstrumpf: Ich mach mir die Welt, widewide wie sie mir gefällt.